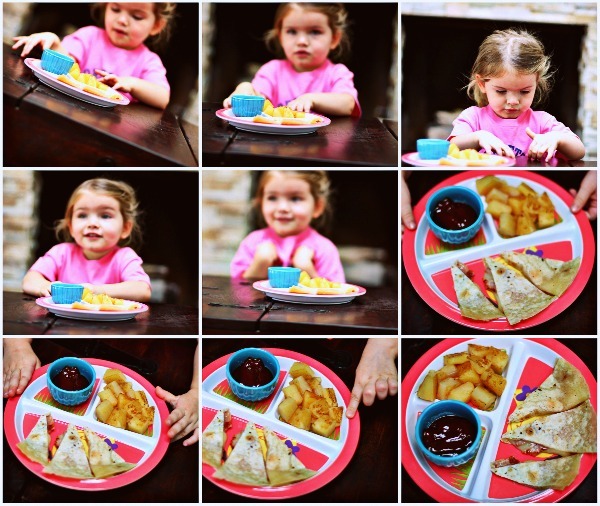 It’s funny watching a 2-year-old wait until you are finished photographing her lunch so she can eat it. Her instructions were simple… stay away from the table until mommy is finished taking pictures. She would move away, then right when I would snap a picture some part of her would sneak in. From her head to the tip of her finger. I couldn’t even get mad at the kid, it was just too cute. 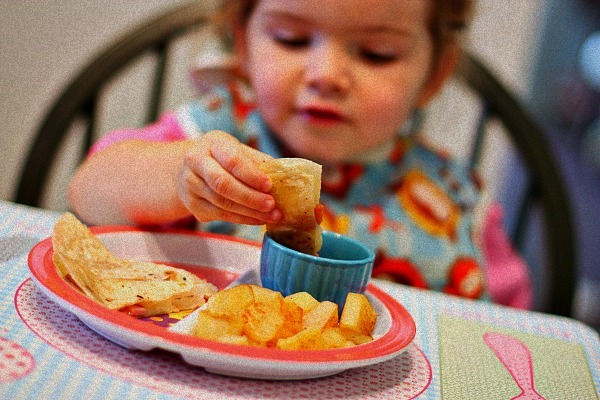 The motivation for M’s lunch came from some Tortilla Land Tortilla samples I received. They are uncooked tortillas that you heat on a skillet and in less then a minute you’ve got fresh cooked tortillas. 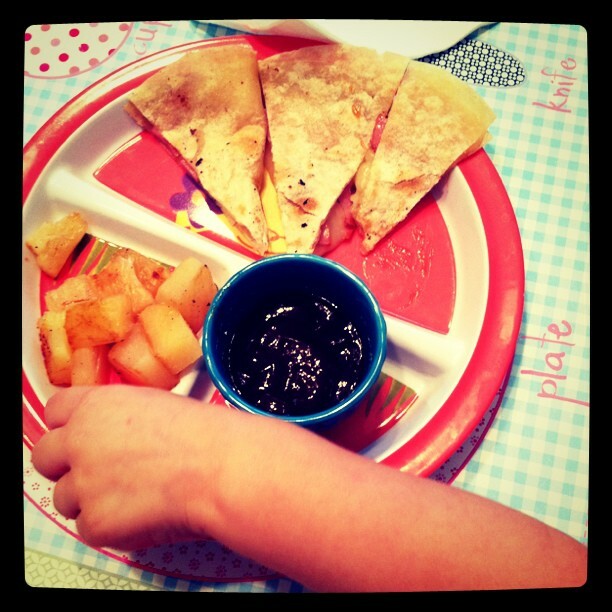 One of M’s favorite foods is a quesadilla. 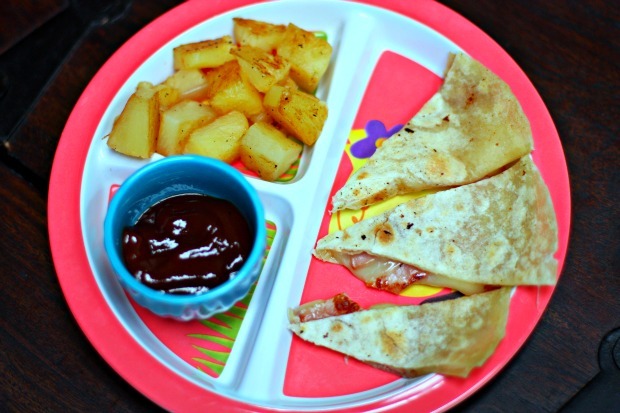 This Hawaiian quesadilla is a one of her favorite versions. 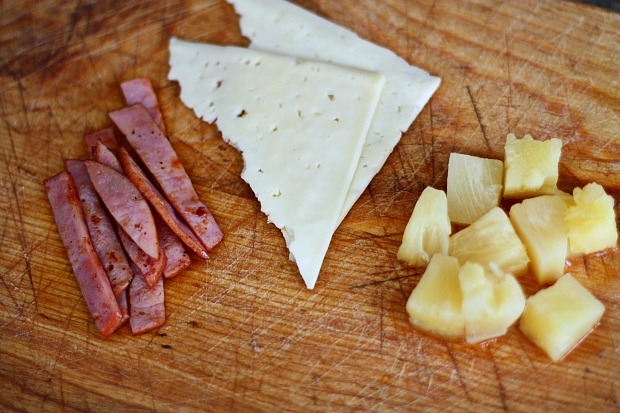 All you need is some canadian bacon, provolone cheese, and pineapple chunks. Heat a skillet to medium heat and cook tortilla for about 20-30 seconds on her side. On one half of the tortilla place the canadian bacon strips, then layer with cheese, and top with pineapple. 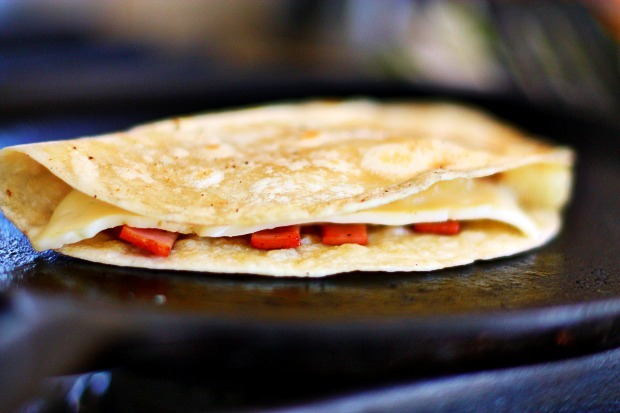 Fold the other half of the tortilla over and cook a few more seconds on each side until the cheese is melty. I serve it with grilled pineapple on the side and honey barbecue sauce on the side for dipping. Love the recipe. I’ll have to make that for myself sometime! Can’t wait to try this on little D! The look of anticipation on her face is priceless. Delicious lunches and they look good, too! Too cute about the BBQ sauce…can’t blame the gal, its my favorite too!